What is the difference between customer relationship management (CRM) and marketing automation? The primary function of marketing automation is to generate leads from marketing campaigns. A lead can be an individual or business that express interest in your product or services and may come as a result of referral or through direct response to your campaigns such as promotion, publicity, or advertising. In other words, marketing automation helps the marketing team generate leads which are potential customers. To do that, the marketing needs to know all it can about the lead or contact such as email address, buying preferences, etc. and store the information in a database. On the other hand, CRM assists the sales team to nurture those leads from information collected in the contact or lead database. Sales people use CRM to analyze the information gathered, categorize and qualify contacts, and follow through with offers or discounts and other similar campaigns, all aimed at transforming leads in to buying customers. Contact management – organizes your contacts by categories for easy sorting or retrieval. For all intents and purposes, this feature is sufficient for a small business to undertake a CRM program like email campaigns or classifying customers based on their records. Sales automation – this main component of CRM software automates the sales process from prospecting to customer inquiry and sending out replies to order taking. It helps you follow up and capture leads. Communication channels – this feature gives you the capability to connect, respond, and interact with customers and prospects from various channels including email, phone, IM or live chat, social media, and forums. Task/workflow management – this lets you efficiently manage activities and schedules, and come up with a contact plan. HubSpot CRM offers a completely free plan to quickly get your sales team up and running. The great thing is that CRM integration features allow it to work with most marketing automation platforms, giving your sales team access to customer information collated by your marketing them. Likewise, marketing automation integration means the software can connect with CRM tools and make available relevant information from the marketing end. 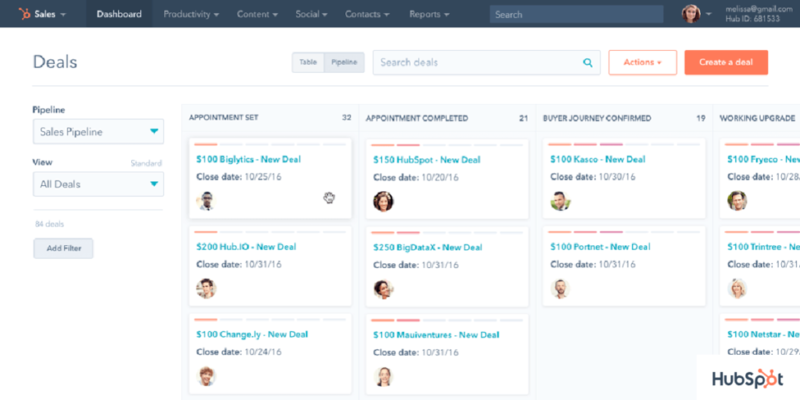 Freshsales – designed for high-velocity sales teams to keep track of contacts while solving their inquiries. It can track emails and events, offers interactive pipeline management, and has an advanced lead scoring system. The vendor has a comprehensive free trial; simply sign up for a Freshsales free trial here. Pipedrive – a highly regarded CRM and sales pipelines management system for sole vendors and developing businesses. It is highly customizable and supports several languages and currencies, making it ideal for global sales operations. You can sign up for a Pipedrive free trial here and enjoy all the features at once. Zoho CRM – award-winning web-based CRM to help you attract, retain, and grow your customers. It specializes in managing leads and contacts, and the sales pipeline. It can scale to any type and size of business and can engage customers in any channel. When you sign up for a Zoho CRM free trial here you can use all the features at no cost. Want to know in detail the above systems? Read our top CRM software for small business here. Lead management – this helps you generate, onboard, nurture, and automate leads. It comes with tools to track and analyze a lead’s activities such as website visits, email opens, completing forms on your website, or reading your blogs. It is also able to forecast lead generation and measure ROI of your marketing strategies. Email marketing – this allows you to compile a contact list from various sources and channels, and send targeted messages, onboard customers, and share both informative as well as promotional content. A/B testing – this essential marketing automation software features enable you to use advanced email segmentation to test the effectiveness of different campaigns, compare results, and to optimize and determine the best approach for your marketing strategies. Exponea gives you analytics and reporting tools to help you understand your marketing performance. Some other features of marketing automation software are analytics and reporting, resource management, social and online marketing, landing pages, and mobile optimization. HubSpot Marketing – An advanced system that brings all of your marketing efforts together to help your team grow traffic and increase conversions. It helps your team prepare and optimize engaging content, and distribute it to the right audience. You can test its features at no cost when you sign up for a HubSpot Marketing free trial here. Exponea – Blends analytics and engagement automation to improve customer experience. It enriches campaigns with artificial intelligence and leverages detailed contact information to make marketing campaigns more effective. It is easy to try its features when you sign up for an Exponea free trial here. Marketo – A comprehensive platform for marketing automation, customer engagement, and marketing management. It has robust social marketing capability, allowing you to share, engage, and promote through social media. Active Campaign – All-in-one marketing platform that offers a variety of tools to help SMBs acquire and engage customers. 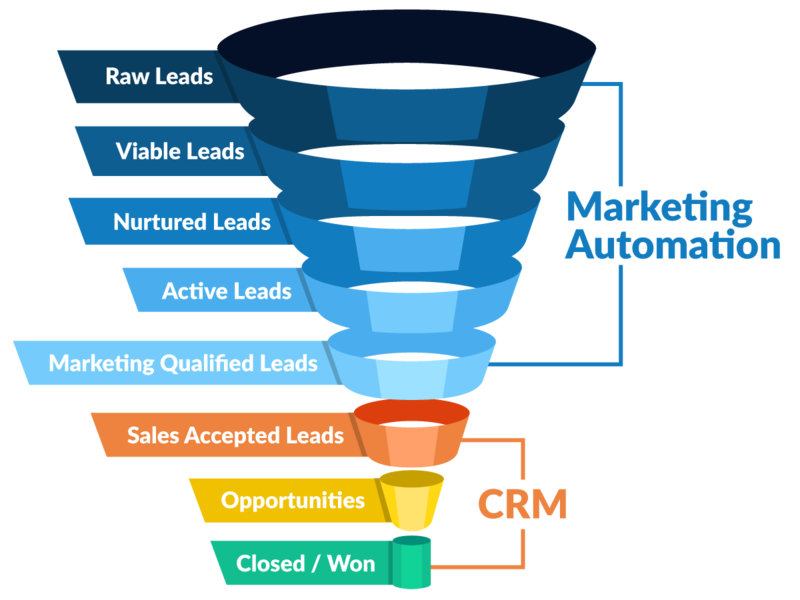 It offers built in CRM and sales automation functionalities to help you manage leads through the whole sales journey. Pardot – A B2B marketing automation and lead management software that enables your sales teams to manage online marketing campaigns. It offers advanced analytics tools that provide insights on the effectiveness of your campaigns. If you are a starting business and want to have an in-depth look at the products above and others like it, you can check out our handy guide on the leading marketing automation for small business. Although a CRM may be the first requirement if you are a growing business that needs to support your sales team with all the necessary tools, you may find the need for a marketing automation solution not far behind. This is especially so when your number of contacts expands and your lead generation activities level up. There are just so many leads, prospects, and customers from so many channels in the present digitally connected world that you may need both a CRM and marketing automation software to adequately manage all of them, just to put your business on the sure and safe side. CRM vs. Sales Force Automation: Does Your Small Business Need Them?